Japanese pottery impresses Cairns artist, Lone White. I recently returned from a two weeks visit to Cairns' two sister Cities, Oyama and Minami, in Japan. I was invited to meet with the ceramic artists there. The hospitality was great; apart from remembering delicious food served on various shaped ceramic wares, I received a short glimpse of Japanese lifestyle and thinking, especially amongst ceramic artists. 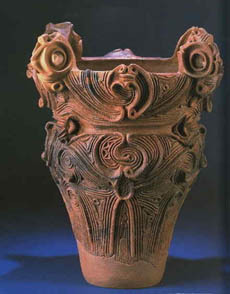 The history of ceramics in Japan from the Jomon period (13,000 BP to 300 BP) remain, to me, the most fascinating of Japanese ceramic works. 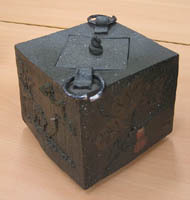 The image of a Jomon pot, below, is copyrighted and shown courtesy of Robert Yellin. 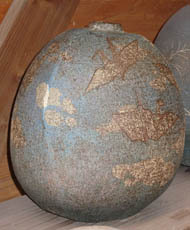 The Japanese pottery tradition is very old and revered and even today, most of the ceramic artists who wish to make a living from making ceramics do not move far away from the traditional wood fired wares, even though some of them now achieve the reduced rice/ ash glaze result by placing the pots in saggars in gas or electric kilns. 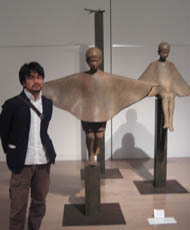 These days Japanese pottery studios also experience shortages of wood and environmental problems with pollution. 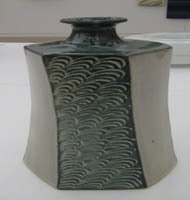 Of course the traditional tea ceremony has also played a significant role in the way a Japanese person views ceramics. There is an (historical) appreciation of ceramics that I do not find here in Australia. It is also reflected in the higher prices the ceramists receive for their handmade wares. I saw literally thousands of pots. In Hagi I met more than 70 potters at their annual ceramic fair held in a large sports hall. Most of the potters there had climbing wood fired ceramic kilns and used clay dug from their own area, a clay that in a reduction firing brought out the most subtle earth colours. In Minami I was taken to visit two potters who had exhibited their works in our “Earth Links” exhibition here in Cairns last year. Both lived out in the countryside in the most wonderful surrounds - Nakouchi lived at the end of a road totally away from hustle and bustle. Interesting enough none of them come from a pottery background - yet all their works had a quiet beauty. In Oyama I met representatives from seven ceramic art groups. They showed me some of their works (all with a strong Japanese influence) and I gave a slide presentation of my works and works from the potters in Far North Queensland. My last day in Japan was spent in Tokyo visiting the Tokyo University of The Arts and the newly opened National Art Centre, Tokyo. I was accompanied by Rooji Namai, Doctor of Art and Education from Tokyo University of The Arts and also well known sculptor. What an experience! The art department of Tokyo University of The Arts was in a large cellar; one could smell the sweat of generations of artists there. 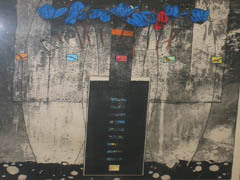 The room had all old furniture, no mod cons, but that did not prevent the artists from making stunning, very modern paintings. The National Art Centre Tokyo is a new Centre opened about two years ago. It is huge! (14,000 square meters of exhibition space) .While there I was lucky to see the annual ceramics, sculpture and textile exhibitions and many galleries of paintings modern to very modern. 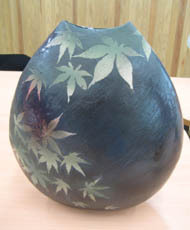 Japanese pottery and all art forms at present are definitely dynamic and blossoming.